Falling in love with the automotive world can happen suddenly, but when it does it is one of the greatest passions in life. 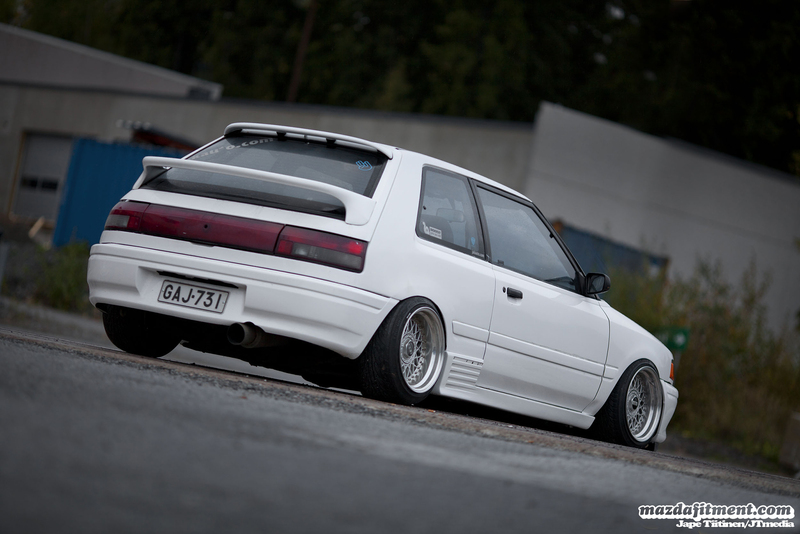 This is the case with Matti Nissinen and his 1990 Pure White Mazda 323 GTX from Kuopio, Finland. Matti got into cars a little by accident. When he was younger he was into bikes, and rode all kinds of two wheeled motorized vehicles until he got his first car. For a long time he had a few Volkswagen cars; Golf MK2 and Jetta MK2. But, Matti found those cars pretty boring and dull over time. 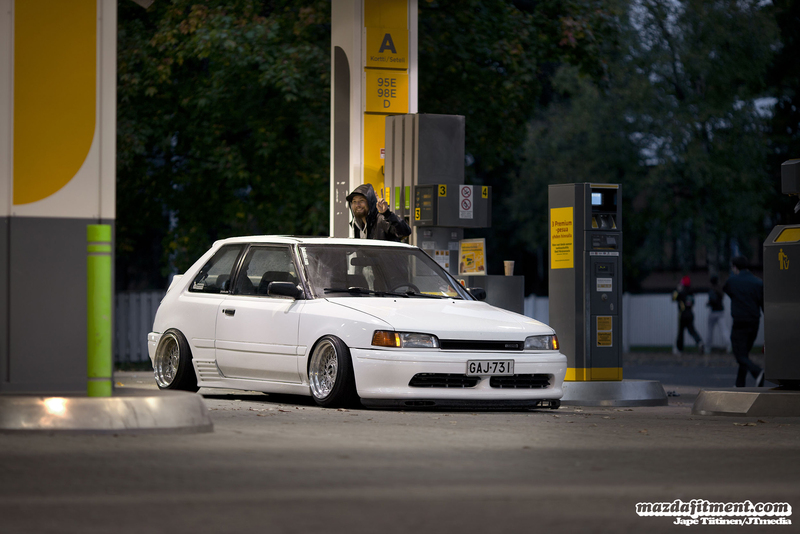 Matti had a friend that actually bought this 323 GTX first. He never knew they made a 323 with 4WD and turbo charged. Eventually, Matti bought this from that friend. It was red, rusted, stock suspension, with beat up Cobra bucket seats, and on 5.5″ wide wheels. At first this was only meant to be the winter car, since it was pretty fun to drift around in the snowy roads; especially since the car wasn’t in mint condition at the time. But after a couple years, Matti took the car to JAK-Auto boy shop, where they fixed all the rust, and repainted the whole car in pure white. While, Finland has a relatively large automotive scene it has been going through a few changes. It is now about fitment, clean rides, and good times for its automotive enthusiasts. Stay tuned at Mazda Fitment Forums for updates on Matti’s car after this winter season. There is going be more frame laying action in the future. Shout outs to Jesse Hyvönen for the huge amount of help with suspension and other little stuff. JAK-auto.com for the paint job and letting Matti use their workshop to work on the car whenever needed. And to Jupe Tiitinen aka JTmedia for capturing these awesome photos. To check out more go to http://www.JTmedia.fi or https://www.facebook.com/jtmedia.fi. If we like it we will share it. hehe, this is great, timeless should i say? What are the body kit pieces? any one link?